Everyone loves a good sandwich. From fancy with gourmet trimmings to good old fashion stick to you ribs style, we have the best sandwiches in town ready for your review. Based on survey results, social media feedback and Gatekeeper sampling we decided this list needed a little more room than our usual Top 5 List. Good and healthy is a hard combination to master, but Fountain of Juice has cracked the code. Their sandwiches are made from fresh, organic ingredients, and are a delight to the palate. The Turkey, Apple and Swiss wrap is a gatekeeper favorite! If you are looking for more meat in your sandwich, then we suggest the Superman sandwich. Harpins is always a go to favorite for the perfect lunch time sandwich. They offer several signature sandwiches served with potato salad, pasta salad or Chips. They are well know for their Chicken Salad sandwich on a fresh croissant. Open Monday through Saturday for lunch from 11am to 3pm Harpins offers weekly specialty sandwiches along with made to order favorites where you select the ingredients and it is made fresh for you on the spot. If you want a good sandwich with some awesome side dishes (You must try the soup) then Harpins is a great choice. Owner Paul Harpin has been on the restaurant scene in Macon for a long time and he knows what it takes to keep his customers coming back for more! ​We love this local favorite. You can have a custom sandwich with all the fixings or a plain ham and cheese. It’s all about what is your heart’s desire. As soon as you walk in, it’s like going to your friend’s house for lunch, you’re always greeted by Joe or Karen and all the food is made from scratch. One of my personal favorites is the smoked brisket sandwich that is a treat for the customers at Joe D’s. If they have it, don’t miss it! Read our full review of Joe D's On Ingleside here. McAlister’s Club (or Wrap), Grilled Chicken Club, Orange Cranberry Club, King Club, Black Angus Club and the Veggie Club. Lanier’s in downtown Macon near the Cox Capitol Theatre is named for Macon native, poet, musician and author, Sidney Lanier. Laniers menu includes a vast selection of sandwiches from the Frat Philly to the Sigma Ribeye that are sure to leave you satisfied. Breakfast sandwiches abound at one of Macon’s favorite downtown coffee spots. Each sandwich is made to order, and is a perfect way to start your day. This gatekeepers favorite is the Turkey Sausage, egg and cheese on an Everything bagel. The breakfast sandwiches are filling, and not greasy so you won’t fall asleep once you get to work! ​This is one of those places that the choices are never ending. My personal fave is a #12, and I can tell you that they know my voice when I call. Super fast, friendly and they always get my order right. The new renovations have made moving around there much easier not to mention it opened up the bottom for a little more sitting room. You can get a free sandwich for a good cause at Subway on National Sandwich Day! In honor of National Sandwich Day on Thursday, Subway is offering a free sub with the purchase of a sub and a drink, and a donated meal for Feeding America. The promotion, called The Good Deed Feed, offers a free sub to guests who buy any sub and drink. Additionally, Subway will donate one meal to Feeding America with every purchase. If international taste are your favorite, then a sandwich from Roasted Café is what you are seeking. The sandwich offering have a Mediterranean and Middle Eastern flare that your taste buds will thank you for. The Greek Heat sandwich is a gatekeeper favorite, and has the perfect balance of flavor and spice. What? You didn’t know IVP had sandwiches? Well you’ve been missing out. Those folks in the know have come to trust IVP to fix up a hearty lunch or even dinner sandwich. Served up sub-style, piled high with meat (or veggies), IVP brings the same quality and flavor that their pizza is known for to their tasty subs. Read our full review of Ingleside Pizza here. In its first 40 years, the Rookery has become a downtown icon that has paid homage to all of the greats that gave Macon it’s soulful past. 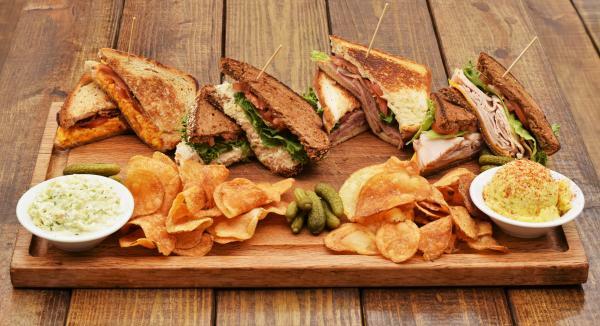 Although known for their burgers, the Rookery offers a vast array of sandwiches. Looking to try something new? We highly recommend that you try the house specialty - BETSY'S GRILLED PIMENTO CHEESE. This Applewood smoked bacon sandwich with roma tomatoes is unbelievably good! A Sandwich shop in the most iconic way, Sid’s is a go-to lunch spot for many Maconites. Our gatekeeper is partial to the plain ole turkey on white, but their Reuben is also one of the best in town. To be fair, most anything that you get at Sid’s is always great because of that “like mama used to make” charm that they bring to each order. There are grilled cheeses far and wide, for good reason. Many of them are good. Some, great. Nothing wrong with a classic grilled cheese, but definitely nothing wrong with stuffing it full of fresh lobster. Chef Lee Clack's grilled lobster and cheese at Kudzu Seafood in downtown Macon sells out fast. Make sure to call ahead of time to stake your claim! Lobster Grill Cheese not your style, check out their other sandwiches such as their Po' Boy's.